He shot himself in the head as he chatted and all his contacts could see the death of the young guy live. According to the newspaper Daily Mail , Trevor George was chatting when other users were terrified as he put a gun to his head and pulled the trigger killing live and direct. None of the witnesses also dared to call emergency services because users were anonymous and did not know where the boy lived. After interviewing witnesses and reviewing computer records have determined that Trevor had not been coerced to fire. 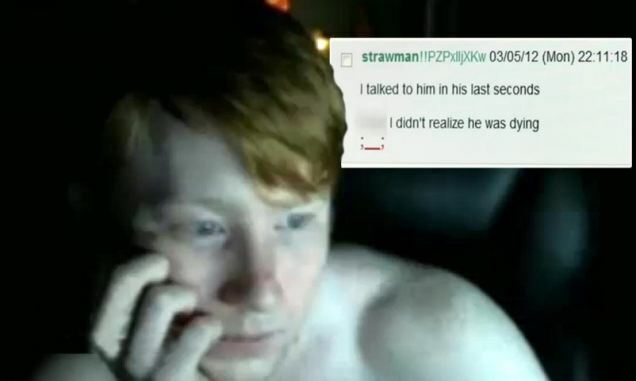 According to several witnesses who were in the same chat room that Trevor was all a joke and the gun must be unloaded. But in the chamber of the gun had a bullet that never should have been there.